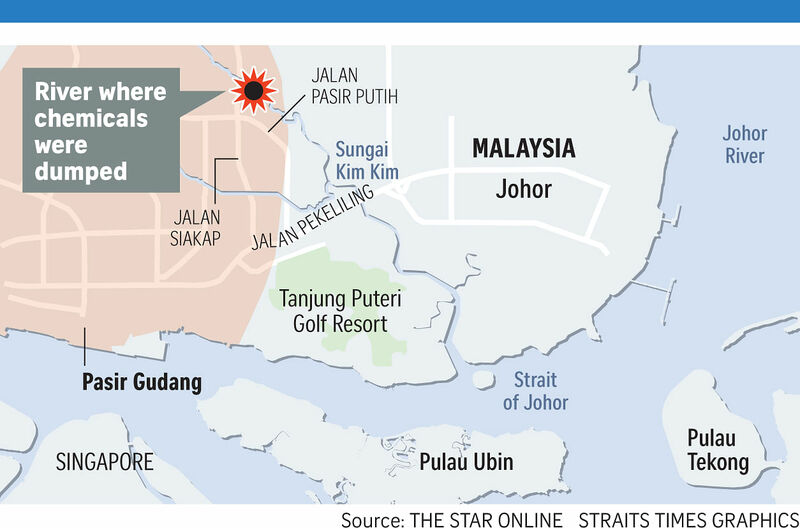 The Singapore authorities yesterday said they have not detected anomalies in the Republic's air and water quality following the chemical spill incident in Pasir Gudang, adding that they will continue to monitor the situation closely. They also said that seawater quality in the vicinity of Pulau Ubin was within normal levels yesterday afternoon. The statement was jointly issued by the Agri-Food and Veterinary Authority (AVA), the National Environment Agency (NEA), national water agency PUB and the Singapore Civil Defence Force (SCDF). More than 2,700 people have been sickened by what is believed to be the dumping of toxic waste in Sungai Kim Kim at Pasir Gudang in south-east Johor. Water from the river drains into the Strait of Johor just north of Pulau Ubin. Of those stricken, about seven were still in critical condition yesterday. The Malaysian authorities are now scrambling to clean up a 1.5km stretch of the river. The joint statement said: "The affected area is outside of the Johor River catchment, and there is no impact on Singapore's water supply. "SCDF, NEA and PUB have not detected any anomalies in our local air and water quality. "The Agri-Food and Veterinary Authority has been working with our farmers to monitor the situation, and no anomalies or fish mortality have been observed at our fish farms." The statement added that Singapore's 24-hour Pollutant Standards Index has been in the Good to Low-Moderate range since March 6. And the one-hour PM2.5 readings remain in Band I (Normal). "NEA has not detected any elevated levels of benzene or other volatile organic compounds (VOCs) at our air monitoring stations. The ambient VOC levels along Singapore's coast remain within safe levels. "The seawater quality within the vicinity of Pulau Ubin is within normal levels." It added: "The authorities will continue to monitor the situation and will provide updates if there are any significant deve-lopments."